It takes the entire 65ROSES TEAM WORKING TOGETHER to reach our 2018 goal of $15,000! 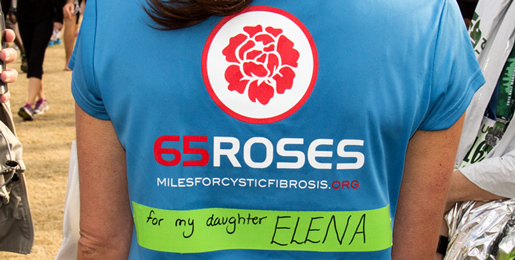 Team 65ROSES members can get free entry into our Partner Races by fundraising. Raising money over the minimum required for entry makes you eligible for additional incentive awards. ​All other fundraising campaigns make you eligible for our fundraising incentive awards. Create your online campaign using button below and send to your donors by email, Facebook, or other media. Your donors will be able to view the campaign and make a donation securely by credit card without visiting our website. It's so easy! Note: You will need to upload a picture to your page as part of the first step in creating your own fundraising page. Collect cash donations and checks made payable to Miles for Cystic Fibrosis. Mail the donations to Miles for Cystic Fibrosis, PO Box 2984, Tucker, GA 30085. Refer your donors to our Donate link, where they can contribute securely by credit card. Tell them to be sure to enter your name in the tribute space provided. Your donations are used to help local CF families in need of emergency financial assistance, to support research toward a cure, and to support our BreatheStrong program which pays grants for healthy physical activities for people with CF. ​Because we appreciate your efforts as a member of Team 65ROSES, we'd like to THANK YOU with great incentive prizes, too. Raise $165, get a Team 65ROSES cap. Raise $365, get a Team 65ROSES car seat cover. Raise $565, get a Team 65ROSES wind jacket. Raise $1,065, get your choice of FREE registration to an event of your choice (up to $150) OR new running shoes. Raise $2,565, get BOTH free registration to an event of your choice (up to $150) AND new running shoes! Raise $5,065, get a Big Green Egg grill package! ​Fundraising Hints: Things to keep in mind as you launch your fundraising campaign! A PERSONAL STORY on why you joined Team 65ROSES carries tremendous weight when shared with others! Pictures speak a thousand words; add a PHOTO to your message. DIVERSIFY YOUR LIST: Expand your reach by going outside your immediate circle of family and friends! Look at your neighbors, clients, vendors, Facebook friends, etc… and give them an opportunity to give back. You’ll be surprised who has been touched by CF at some point in their life! SHOW YOUR THANKS: Customize your “thank you” message with a special note from you, along with writing thank you notes to those that donated via cash or check. Then, when the event is finished, send a group “thank you” message to everyone who contributed. This will be your“I did it!” message.